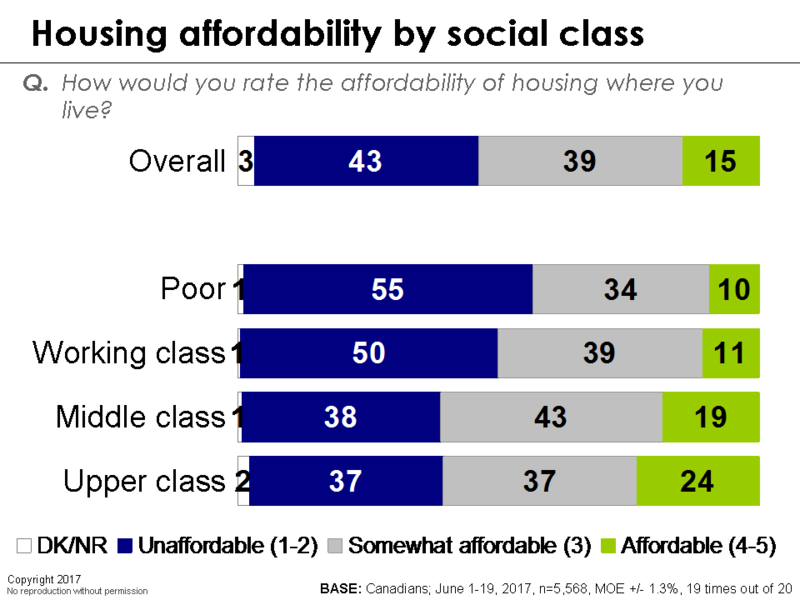 [Ottawa – June 27, 2017] Housing affordability is a national issue, but it really depends on where you live, how old you are, and your social class. 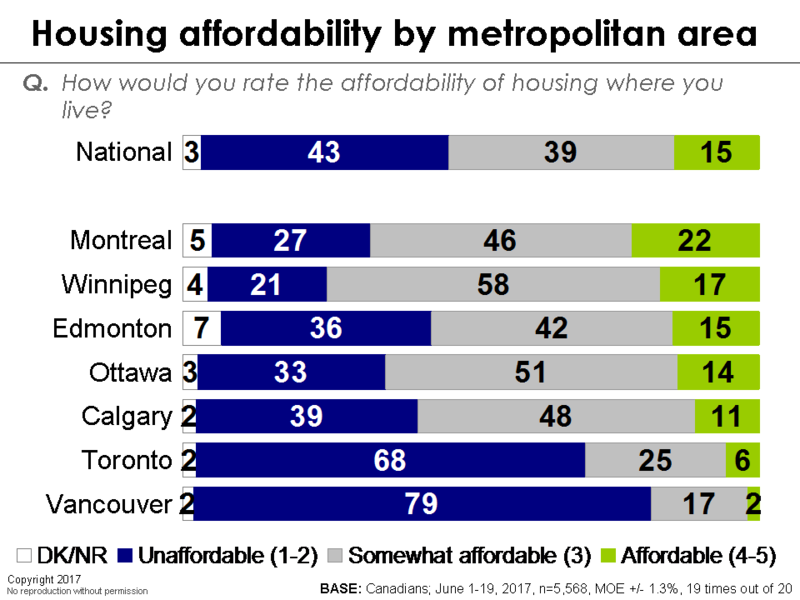 At the national level, a plurality of Canadians say that housing is unaffordable where they live, compared to just one in seven who would rate housing as affordable. Affordability is approaching near crisis levels in Vancouver and Toronto, which are by far the two most unaffordable markets in Canada. The vast majority of respondents in these two markets rate housing as unaffordable; just two per cent of Vancouverites and six per cent of Torontonians feel that housing prices are reasonable. At the opposite end of the spectrum are Montreal and Winnipeg, which rank as the most affordable of Canada’s seven largest CMAs, with just 27 per cent and 21 per cent, respectively, encountering financial hardship in acquiring housing. Economic means and social class are predictably linked to affordability issues. Indeed, half of those who identify as either poor or working class find housing to be unaffordable. Even Canada’s middle and upper classes can’t seem to escape the burden of surging housing prices, with two-fifths expressing concerns over the costs of housing. 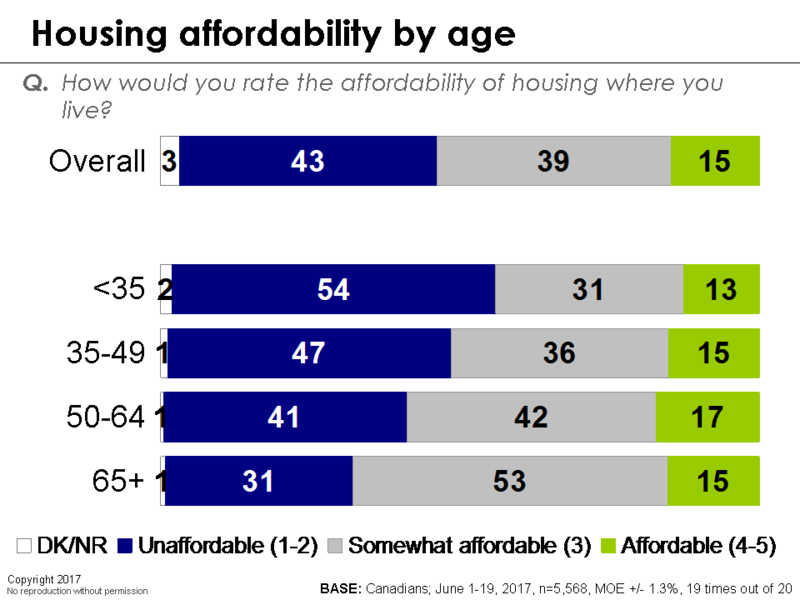 It is also the case that young Canadians and not-so-young Canadians (i.e., under 50) are finding steep affordability barriers with about half saying it’s unaffordable. Because shelter is an essential service (like health care or nutrition), we need to re-open the issue of making housing affordable. It is very troubling that more than two in five Canadians are finding difficulty paying for shelter. In the past, governments actively intervened to deal with housing affordability issues and they still do, but clearly with limited effectiveness. It may be the case that we need to consider vigourous policy measures to confront this near-crisis. Some of the tools of the past – such as non-profit and social housing, rent control, and other regulations to combat unhealthy speculation in housing markets – all need to be re-evaluated in light of current circumstances.